Back to school is quickly approaching so we’ve put together some easy back to school tips for you and your family. Plus, you can enter to win a $1,000 Visa Gift Card while you’re here! Good luck everyone! Shop Early. Don’t wait until everyone else is shopping. You’ll be running around like a crazy person! I’ve found doing it as soon as you have your list is best or do a little at a time so you can budget over the summer. Adjust Your Schedule. Start easing your family back into a school schedule a week or two before you start school. My son is an early riser so I don’t have much trouble with this but I do know a lot of kids that sleep in over summer break! Get them in a routine before the first day of school starts. You will thank yourself for this when everyone is ready to go the first day of school. Create a Calendar Spot. Create a place in your home for calendars. This will be where all your kids and spouse and look to find schedules for everyone to see who needs picked up when and where. It will create a lot less confusion in the long run. A fun idea is to paint chalkboard paint on a small wall space for everyone to write quick daily notes. Create a Homework Station. I think it’s best to have your homework station near the calendar. I always put everything in my son’s backpack the night before and hang it on a hook in our porch. It’s quick to grab of a morning on our way out the door. Back-to-School Supplies Checklist. Backpack? Check. Pencils? Check. Safety scissors? Not Yet. Use the same checklist each time you head out to grab supplies, to keep track of what you have already purchased and the things you still need to. These are also handy if you have more than one child. Simply print 2, 3, 4 list and add their name to the top. The Back to School Blast was organized by Mom Powered Media. Please take a moment to also visit our lovely co-hosts, whom without them great things such as these would not be possible: My Vegan Gluten-Free Life, Plum Crazy About Coupons, Capri’s Coupons, Downshifting – Your Family, Your Home, Your Life, Jack of all trades, Master of Mom™, Quick Tattletails, Mew Review and Iowa Mom. 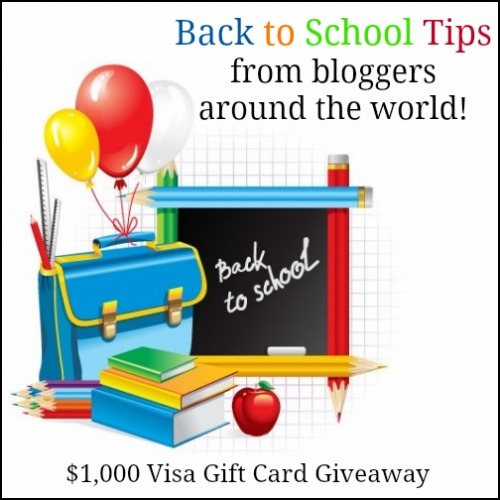 One lucky winner will receive a $1,000 Visa Gift Card! Giveaway ends August 15th at 11:59pm, open worldwide, ages 18+. If the winner resides outside of the US, they will receive Paypal cash. To enter please use the Rafflecopter form below. Good luck. Disclosure: Giveaway Bandit is not responsible for sponsor prize shipment. Please contact teri@mompoweredmedia.com with questions or to see your business or blog featured on the next big event! Get a good night’s sleep for a few nights prior to school starting and set your alarm so that you wake up early and are kind of use to it before school starts so it isn’t such a shock when the real deal arrives. Be yourself and always walk with your head held high. School can be tough, tackle it with your eyes open and ready to learn. Stay organized with a planner helps lots with school activities and after school sports. Just enjoy the school year! Make sure you get a full night of sleep, that way you are able to focus on learning! Have a good breakfast. It’s hard for kids to learn and pay attention on an empty stomach. Do not let kids wear their new clothes before school starts. Pick your clothes out the night before. Get a head start on all back to school shopping and routines! We shop as a group and we each search out one of the things on the list. Which saves time, which is money. Have your teenager make a list of what she thinks she needs, and go over it with her before you both go out shopping. Have a game plan ahead of time! I get my children to start getting up and going to bed 2 weeks before school starts. If you get a chance to visit the school before it starts to meet the teacher or explore the classroom, take advantage of it. It helps build confidence going into the first day. you can get the school supplies list for your children at their schools website online, that is what we do, to get started earlier than school starts. Make sure they eat a good breakfast too! Go to bed early the night before school starts and eat something for breakfast. Don’t buy a lot of supplies until you get a list from your childs school of what they need. Not good buying a bunch of supplies to learn that this year they need something different! My daughter’s supply list is sent home on the last day of school, if this is the case for you, definitely purchase supplies sooner then later! The longer you wait the more you risk loosing the list or doing last minute shopping when everything has been picked through and you can’t find supplies you need. Start adjusting the school schedule-3 weeks before start going to bed earlier and setting alarm to get up earlier. All you need to do is get some sleep & study study study! I encourage my son to participate in the shopping for clothes, etc. I also get him back on the time schedule a week prior to school beginning. Get every thing ready and organized a week before school starts! Stay involved with your child! Start adjusting your child’s sleep schedule a couple of weeks before school starts. Start gathering supplies/ school clothes etc as early as possible. Layout the kids clothes the night before! Make sure that everything is laid out for the next morning, lay out clothes, make sure back packs are where they can be found, set out cereal bowls, spoons and whatever else you might use for breakfast. If it is set out the night before it will save time the next morning. Plenty of sleep, proper nutrition, stay hydrated and ENJOY it! Shop early & use coupons. Set everything out the night before – clothes, shoes, backpack. Have a consistent bedtime on school nights. Give your child a healthy breakfast so they have the proper energy they need! Speak to your child about bullies so they would be aware of what to do if they ever get close to someone like that or see someone getting bullied. Start a back to school schedule weeks in advance of school starting.